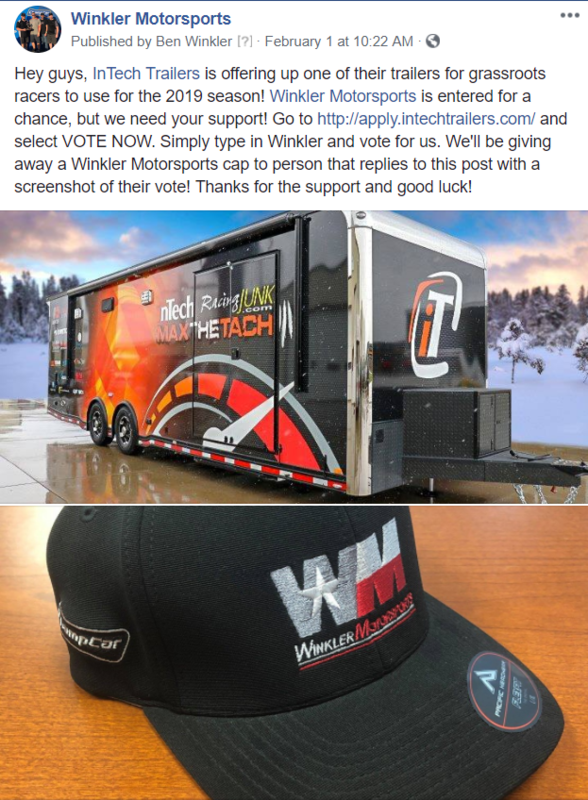 So, we were driving back from the Daytona 24 the other day and we stumbled across a contest to win the use of a intech trailer the other day. We decided to enter it not really thinking much of it. Well..come to find out we made the first cut for the top 25!!! So now we really, REALLY need some votes!!!! We really want to bring this trailer to INDY for everyone to check out, so help us help you and put us into the top 10!!! Lol appreciate that! We need to work on our social media presence a bit more, more hot blondes, less fat guys I guess. We don't really have a social media presence besides here and maybe our personal facebook stuff, but we are in the same boat, minus the fat guys. We are only surrounded by hot women..and by that I mean our angry spouses. Voted, best of luck to you guys! Voted, good luck guys, those are some.....interesting....other teams you're up against. Yea, a lot of drag racers, one or two road racers (including us), and some other randoms. Should be interesting if we make the top 10. If you win, can we reserve a trip to indy with it? Might be booked that weekend since we will be at Indy, but I'll most certainly let you look at it, from a distance of course...no less than 20 feet. @Bill Strong We kinda assumed it would be ok to pimp you guys in our bio for the contest? Y'all cool with that? Yes. Please pimp @Bill Strong. LAST DAY TO VOTE FOR TOP 25!!! PLEASE PUT US IN THE TOP 10!!! Lets do this Champcar Forums, lets make a baby...or a trailer....you know what I mean. Thanks for all of the support!! Thanks to all that voted! We will find out Friday at 4pm CST if we made the cut. If so, I'll be back looking for more votes to make the top 5. Dang...I was too late. Hopefully you make the top 10.